Huge home loss for ISU, drops them into tie with KU @7-4 and maybe TT if they can win in Norman today. Meanwhile KSU (7-2) plays at Baylor (6-3), and everyone outside of kitties fans wants Baylor to win. KU plays TCU in Fort Worth on Monday. TCU's win over ISU was big for KU. But equally big is Baylor needs to beat K-State. I have uodated the DPPI through all the early games of the day. KU moves up from 15 to 13 which is still tops in the Big 12. But the loss to West Virginia is killing us in the probability standing. We gained 1/10th of a game on K-State and passed Iowa St. We are now in 2nd but just barely and still 8/10ths of a game behind KSU. Baylor is a 59% favorite to win. If they do, we will gain at least 6/10ths of a game on K-State and possibly more if Baylor blows them out. That would put us at a mere 2/10ths of a game behind and clearly change the probabilities. Right now we have a 28% probability of at least a shared title. Not good enough. Go Baylor!! 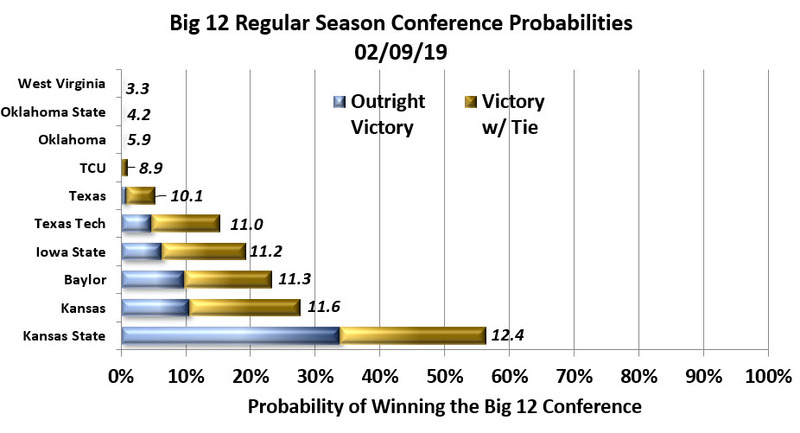 BTW, the TCU win really solidified their NCAA prospects and took them way off the bubble. They are now ranked 37th. OU could sure use a win at home against Texas Tech today. They are now in 8th in the Big 12 and ranked 40th overall. Kansas is ranked 2nd in offense in the Big 12 (Iowa St. is 1st) and 7th in defense.